For those of you old enough to remember, Mr Dan Hanebrink is not only a six-time MTB National Class Champion and a NASA aerospace engineer, he just happens to be one of the most influential figures in the history of Gravity Bike development. He is the godfather of gravity people! That's right, amongst his long list of motorbike and cycle innovations, Mr Hanebrink teamed up with Hutch in the late eighties to produce the Hutch HPV Superbike (which we have previously featured) along with a raft of other awesome gravity inspired bikes like this little baby. He tested and developed fairing bikes and encouraged a whole new generation to bomb hills and develop new ideas. In the early 2000's Mr Hanebrink's son Jared was at the top of the Gravity Bike tree, riding and racing Gravity Bikes at events that we can only dream about, with sponsors that would bring a tear to any racers eye. 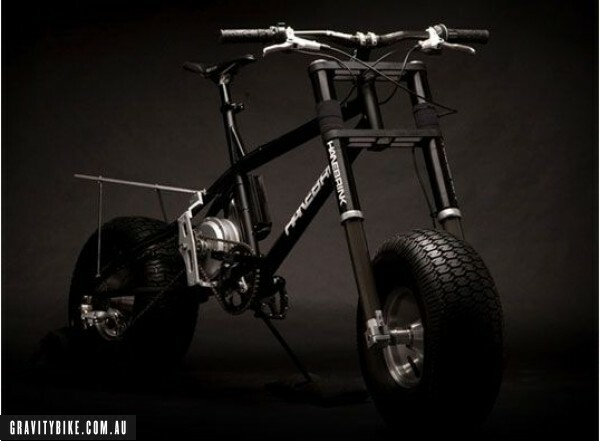 As part of Mr Hanebrink's ongoing commitment to innovation and bike development, his company Fortune Hanebrink has released a "all-terrain pedal-assist vehicle that is one part bicycle, one part motorcycle and one part Mars rover". Check out what TheCoolist had to say about it here and put your hands together for the Godfather of Gravity! We all owe Mr Hanebrink for his contribution. For some further historical pics check out Vintage BMX here.